A new program of the Department of Agriculture aims to help farmers process their harvests more efficiently through several newly-designed machineries. The Department of Agriculture’s (DA) Philippine Center for Postharvest Development and Mechanization (PhilMech), in partnership with the Department of Science and Technology (DOST) has introduced new technologies that farmers can use in processing rice, corn, coco water, and other agricultural produce. The new compact corn mill intended to reduce the physical labor of the farmers can now process up to 250 kilos of corn per hour. This technology, according to DA Secretary Proceso Alcala, is now available to corn farmers in the Visayas and Mindanao region. A number of the machineries were already distributed to some of the farmer groups and so far the feedback has been great. For the coconut farmers, the innovative coco water pasteurizer-chiller can be used to aseptically extract the coconut water. At the same time, it can also be used to cool the produce before it is delivered or consumed. This gives the farmers a chance to earn more income from the nut since coco water is usually drained before it is processed. Other equipment made available by the DA includes attachable harvesters and planters for rice farmers that can be attached to the tractors. There is also a 10-row onion planter that can help in developing the crop in terms of bulb size and maturity rate. Farmers can inquire for these equipments through direct purchase from PhilMech’s accredited manufacturers or fabricators. Price may range from P70,000 – P500,000 depending on which equipment the farmer is interested in acquiring. For those who can’t afford these technologies, the DA can give the equipment to qualified farmer’s organizations through a grant. “We strongly encourage and assist farmers to mechanize their production processes – from planting to harvesting – to increase efficiency, reduce postharvest losses and lower cost of production in the long run,” Alcala said. The DA secretary once said that labor cost is one of the major reasons why production expenses in the country remains high. This mechanization program aims to reduce those costs. It will help farmers to earn more and work less through its continuous development of farming and post-harvesting technologies. “This year alone, the Department of Agriculture has earmarked P4.16 billion for agri-fishery machineries, equipment, and support services under the 2014 national expenditure program,” Alcala said. 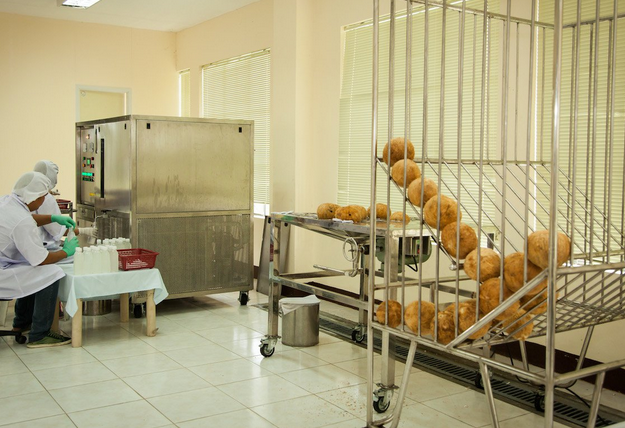 Photo (courtesy of DA) shows the coco water pasteurizer that facilitates germ-free extraction, pasteurization, and chilling of natural coconut water.